Riding a bicycle is healthy of course - so why would you need a prescription for it? At Boston Medical Center, the "Prescribe-a-Bike" program can get you a steep discount on the city's bike-share program. "I hope we see our patients on bicycles riding to and from this hospital and around town, improving their health in the process," says BMC physician Dr. Alan Meyers. "Prescribe-a-Bike" encourages low-income Bostonians to join the city's bike share, Hubway, for just $5 a year. An annual membership normally costs $85. It's a way for the city to connect its underserved residents with affordable transportation while promoting a healthy lifestyle. "It may be very hard for people to find a place to exercise. Neighborhoods may not be safe. So what we're hoping is that instead of perhaps riding the bus from point to point within the city of Boston, people will be able to get on a bike and ride from station to station," says Dr. Meyers. Hubway is in its fourth season and offers 1,300 bicycles at 140 stations throughout Boston. Recently, it has expanded from the city's center to lower-income neighborhoods. 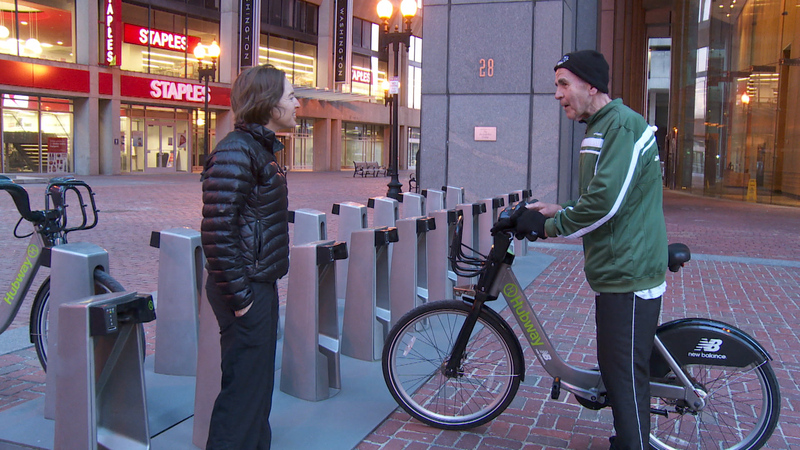 "The people that were using bike share weren't necessarily representative of the city as a whole and we said 'look, we want to make a really concerted effort to get low income residents on to bike share,'" says Nicole Freedman, the director of the Boston Bikes program. Freedman says Hubway has sold about 900 subsidized memberships and expects success with the "Prescribe-a-Bike" program. "I hope we're a model for how to do it right," says Freedman. Roxbury resident Teagan Anderson commutes 30 minutes to and from work on a Hubway bike. As she returned her bike to the Roxbury station on Columbus Avenue - about three miles outside of central Boston - she said, "I think it's a necessity. Lower-income people don't always have cars and the T doesn't come out here." Dr. Meyers admits there's still a long way to go with the new program. "We have high hopes, but we haven't realized them fully. We're on the threshold, I would say." It's a new form of public transit, in Boston and other cities, that is just getting on the road.